Was this imperfect action RPG worth the wait? Offers a fantastic road trip, even if it's not a particularly in-depth RPG. What is it? The latest Final Fantasy game, finally on PC after 15 months of waiting. The wait for Final Fantasy 15 on PC has been long, following lots of talk about optimisation, mod support and nicer-looking hair. If you've waited fifteen months to play this roadtrip-themed action RPG, though, it looks fantastic, and arrives in a more complete form than it did on consoles. Final Fantasy 15 represents a big transformation for the series. While previous entries are better-known for turn-based combat, or real-time with a complex strategic layer in the case of FF12, this is a pure action RPG—and a pretty simple one, at that. 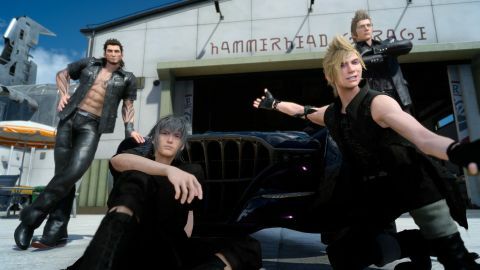 Your character, Noctis, rides around in a car with his three friends for most of the game. You can take on sidequests, hunts for specific creatures and tackle dungeons that unlock new weapons. The second half of the game is more linear, which doesn't play to the game's strengths as much. FF15 is at its best when it's focused on the idea of a road trip between four friends. As well as including all of the updates from consoles, the Windows Edition arrives with all of the DLC released so far (the three character-centric standalone episodes Gladiolus, Prompto and Ignis, plus the multiplayer update Comrades) and many graphical upgrades. You also get a more embellished finale than the other platforms originally did, making what was a rushed closing chapter into a more satisfying (if still slightly incoherent) climax. When running Final Fantasy 15 off of an SSD, the game ran without problems, although when running off of a regular HDD, loading screens would sometimes take multiple minutes, and the game would occasionally stutter at the start of combat. Separately, the PC Gamer team UK has experienced some occasional framerate dips in hardware above minimum spec but below recommended. Tom Senior's 970-equipped home PC (i5-2500K 3.3GHZ, 16GB RAM), running the game at 1080p on average settings, hitches 'fairly often' in his words. Check out more details on the graphics settings with different specs here. What Final Fantasy 15 is particularly good at is creating a spectacle. Fights feel grand and often earth-shattering, with battles against enormous creatures backed by operatic music that really heightens the sense of drama. Summons return to the series in their most extraordinary form yet—they're powerful giants that'll lay waste to most opponents in the game, even if you're not really in control of them. The graphical upgrades for PC only accentuate this strength of the game, with improved visual details and resolution options. The world is gorgeous, and fun to explore. The four main characters do most of their travelling in the Regalia, their royal car. From the scenic and chilled out Galdin Quay, to the desert wastes of Hammerhead, or the the bustling town of Lestallum, the boys drive up and down across the map, chatting and admiring the scenery as they coast down the near-empty roads. Cruising around is one of the best parts of the game in terms of low-key characterisation and world building. Rather than being a segment where you'll want to alt-tab away—although there’s something to be said for alt-tabbing during a ten-minute-long drive to a sidequest destination—the journey is a crucial part of the experience, even if the actual driving part is guided and pretty hands-off (though you can take the Regalia off-road at a certain point). It allows you to see little animations and smaller interactions between the crew as they ride along. They emphasise this feeling of a road trip, of a camaraderie between friends. That said, it remains the simplest Final Fantasy game there’s ever been, and a weak open world RPG compared to the likes of The Witcher 3. Sidequests rarely amount to more than ‘collect this item or kill this thing for me’, and pretty much all of the supporting characters are forgettable. The RPG part of Final Fantasy has been streamlined, here. Completing main quests gives you more than enough experience to keep up with the story’s level expectations. The Ascension Grid, FF15's progression system, provides little more than simple upgrades. Grinding is a thing of the past thanks to these changes, but it means there’s little incentive to deviate from the major story quests when your other options aren't particularly interesting. Conversation choices don’t offer much aside from a little flavour, and there’s no real strategy in fights except stabbing enemies in their weak points and calling your buddies to do their special moves. It's not much of an RPG, really—not in the traditional sense. Final Fantasy 15 lacks the depth a turn-based system arguably allows, but the level of spectacle does compensate for this on some level. Characters will team up for chain attacks that are beautifully animated, and your party's special moves let the combat to change pace. It's usually the longer fights where the lack of depth is highlighted, and you're mashing the same buttons over and over again. There are just a couple of attack commands. While you can swap weapons out mid-fight for faster or slower attacks, the complex strategies you could pull off with status effects and the strengths of different party members in previous Final Fantasy games just aren’t here. The game’s one primary attack button can, pretty much, be held down to constantly attack. You can get through most of the basic fights in the game this way. There is Wait Mode, which pauses time if you stop moving, attacking, or doing anything, and acts as a way to assess a situation strategically, but it also breaks the flow of real-time combat unnecessarily. The magic (referred to as Elemancy) is just as simple. You have to absorb Fire, Ice, or Lightning elements found around the world, crafting spells with elements and special catalysts that can improve the effects. The limitations creep in when you run out of elements, though, and you’ve got to run across the map to find a new resource point to replenish stocks. They’re few and far between, meaning Elemancy isn’t a viable way to fight every battle. It’s nigh-on impossible to turn Noctis into a Black Mage. On a story level, at least, it feels more like a traditional Final Fantasy game—there's just not that much of it in the game. Noctis becoming a king and freeing the world from darkness take a distant second place to the relationship between him and his best friends. That friendship is conveyed in so many interesting and effective ways: through the high fives they perform after a successful battle, their in-game conversations or their commentary on the photos that document each in-game day. It's hard not to be won over by the earnestness of it.